Wondering if you're going to last forever? Find out in under a week. Later, as I’m running through the airport, trying to find my gate, I hear, “last boarding call for Sharon Podobnik” and I start sprinting, my bags bouncing wildly behind me. I find my gate. I skid to a halt at the scanner as they are closing the door, and fumble in my bag for my phone. Thankfully, I’d taken a screenshot of my boarding pass – but now to bring it up in time! Gasping for air, I continue the sprint down the jet bridge as the flight attendants make their final announcements and close the door behind me. I stare blankly at the faces on the plane, and scan the rows. My eyes land near the back and I bumble my way down the aisle, finally slinking into the last open seat. This has come to be known as Mark-time. It took several of these very stressful experiences in order for me to first identify and then communicate that I hated every single second of it. The “thrill” of catching the door is nothing short of torturous to me and I go to great lengths to avoid it, backwards-planning down to the minute what time I need to leave in order to make every transfer and connection with ease to revel in the journey. Getting to this understanding has taken a number of trials and errors and a good supply of tears from time to time, but we’re here, we’ve made it, and we have a solid way of moving forward so that we can maximize efficiency but not stress me the hell out. What does this have to do with compatibility and travel? Can you agree on big ticket items? Before your flight even takes off, you’ll need to have some conversations to see if your styles align. What happens when he’s dying to see Macchu Picchu and she has ZERO interest? How do you communicate your desires? Do you disagree effectively? Does one person tend to compromise more or is it equally shared? Can you agree on the little things? After you’ve decided between an all-inclusive resort on the beach vs. backpacking through the wilderness, you’ll need to hammer out some of the logistics. Whether you take the metro from the airport or a taxi might be the start of it. Can you agree on whether this guagua is safe enough to take? Whether or not we should pay $100 for a guide or go it alone? Do you share priorities? Luckily, we are both into all types of travel. We bounce easily from a city-walk to an adventure hike to a luxury resort, sometimes within the span of a day or two. But after years of travelling together, we’ve realized that it has to be in that order. I do not like getting all relaxed and then heading into the city. Excitement, then relaxation! Similarly, it’s important to know if she loves cruises and he gets motion sickness – will you be able to find a way to enjoy the world together? You’ll be spending the rest of your life with this person – will you be able to find common ways to enjoy your time? Do you see eye to eye financially? It’s important to know your partner’s stance on all of the above. Is she willing to gamble a thousand dollars away in Vegas? Is he going to barter in the market down to the dime? Make sure you have a solid plan for how you’ll pay for things on your trip and an understanding of what will happen in case of emergency. Do you see eye to eye culturally and philosophically? In different parts of the world, you will meet individuals with radically different life circumstances. The conversations about what you see and experience are serious insights into personal reflections and, honestly, biases. How will your partner react? What conversations will you have about other walks of life? How do you react to stress? How does he react when the airport magically can’t find your flight reservation? How will she react when the tour she’s been looking forward to has been cancelled? Both of these have happened to us in the last six months – it’s important to know how you and your partner react to that stress and solve the problems, or don’t. Is your partner ready to take care of you when tragedy or illness strike? You’re at an all inclusive beach resort and he slices his toe open – he can’t get it wet or near the sand. She’s so sick that she’s confined to laying on the cool of the bathroom floor. How does your partner react? Is everything ruined? Can you make the best of the situation? How do you need to be taken care of? What are you willing to do for your partner? And when you don’t agree, how do you manage the disagreement? Does a shouting match ensue or can both parties keep it cool? Are there lasting grudges or is a decision made and you move on? You won’t always agree. Disagreement is healthy and normal. How you manage the disagreement is everything. John Gottman and other researchers are able to predict a couple’s staying power from the precise minutes when a couple is having a disagreement with astounding rates of success based on the presence or absence of criticism, contempt, defensiveness or stonewalling, all of which are highly corrosive behaviors in a relationship and are indicators of trouble down the line. 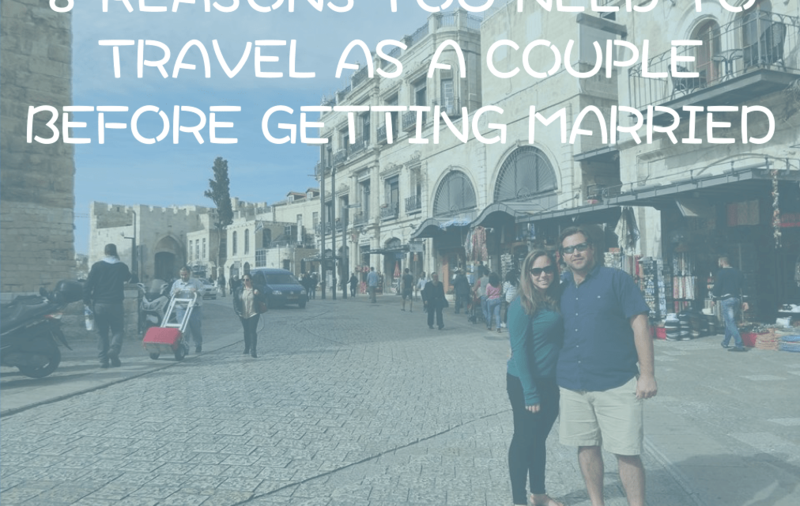 While travel can involve some of the happiest moments of a couple’s life, there are always disagreements to be had and viewpoints that arise that might have been here-to-fore uncovered. Have an authentic conversation about the behaviors and observations to gain a deeper understanding of who your partner is before making the serious commitment! Great question. Click here to learn more about me and click here to follow my travels. Please enable my love of Pinterest, Instagram and Facebook.